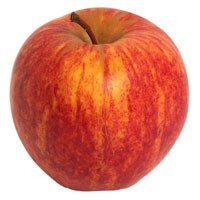 Apple purists tend to dismiss supermarket varieties like Gala as bland and boring, however it has to be said that if you want a reliable sweet easy-eating apple, Gala is actually hard to beat. ROLD GOLD Rods Pretzels are a unique combination of great taste and good fun rolled into one great snack. Kellogg's Frosted Flakes to Go Cereal.Of Corn.Tony. They're Gr-r-rate!. TOSTITOS SCOOPS! Tortilla Chips are a unique combination of great taste and good fun rolled into one great snack. General Mills Chex Mix Traditional Snack. 60% Less Fat than regular potato chips. For a spreadably smooth sandwich, Peter Pan Creamy Peanut Butter is the best. When your crew calls for that peanutty flavor, grab a jar of this scrumptious spread and enjoy the simple pleasure and magic of Peter Pan Peanut Butter. Cooks in 2 min. Pepperoni pizza In a crust. 0 g trans fat per serving. 7 essential vitamins & minerals. Good source of calcium. US inspected and passed by Department of Agriculture. Enjoy your favorite pizza styles anywhere, anytime! Wherever you go, whenever you want, your favorite pizza is always close at hand. Unleash your pizza craving with Hot Pockets brand Pizzeria Style pizzas! It's Good To Know: Good to remember! Most people need to increase their calcium intake according to the Dietary Guidelines for Americans. Good to know! This Hot Pockets brand sandwich is a good source of calcium. Nestle - Since 1866. Quaker Instant Oatmeal Strawberries & Cream.Est 1877.Artificial flavors.Artificially flavored fruit pieces & non-dairy creamer.Heart healthy*.Per packet:130 Calories.0.5g Sat fat, 2% DV.180 mg Sodium, 7% DV.12g Sugars.Calcium 10% DV.Iron 20% DV.10 - 1.23 oz (35 g) Packets.Net Wt 12.3 oz (350 g). Capri Sun Roarin' Waters Wild Cherry Flavored Water Beverage.No artificial sweeteners.No high fructose corn syrup.No artificial colors, flavors, or preservatives.Natural flavor with other natural flavor.30 calories per pouch.10-6 fl oz (177ml) pouches. Perfect way to stock up on bottled waters and snacks for the parks!